Shwe Yo Vintage Hostel i Yangon, Myanmar: Reservér nu! 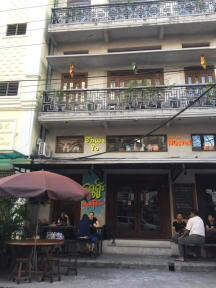 Shwe Yo Vintage Hostel was opened in December 2016 as a home away from home, where anyone from around the world can relax, exchange ideas, and share experiences. Shwe Yo is strategically and centrally located in the heart of Yangon. Many local attractions can be easily accessible by foot. Shwedagon Pagoda is only 25 minutes away. Sule Pagoda is 12 minutes away. At night, 19th street, which is only a 5-minute walk, is filled with restaurants and food stalls where both locals and travelers gather.